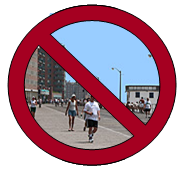 Yesterday afternoon I received an email from the Snowflake Run race organizers that said "Due to weather conditions, the race has been moved off the Boardwalk." I'm sure they did that for good reasons but I'd signed up for this race mostly to run along the water. I guess running on the wooden boardwalk with ice and snow could get slippery and dangerous. But after all, it's called the Snowflake Run for a reason! The new course will be routed through the town streets and that will be fine, but I'll miss those views. I enjoyed my guilt-free rest day this morning and I'm hoping that I'm not over confident about my readiness for Saturday. In the past I've made the mistake of assuming that a shorter race like this one should be an easy distance to cover. That would be true if I was planning to run it like a typical weekend training run but, in competition, any distance requires proper training. I hope I've done enough to prepare for this race. If it's snowing, sleeting or raining tomorrow it will impact how I run. I'll bring along my trail shoes just in case.